Finches make lively virtually "hassle-free" little companions! 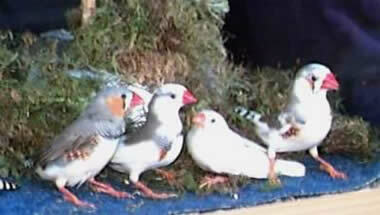 Finches are very neat, they are also quiet and easy to care for. A perfect pet for people with limited space and time. Unlike a parrot, a finch does not require daily interactive attention. The keeping of finches is a worldwide hobby! These delightful little birds are found native throughout the world and there are hundreds of species. Finches are very attractive and active. They come in a wide variety of colors, patterns, and personalities. Some have been kept as pets for over 500 years! What "Family" does your pet finch belong to? Finches are very hardy, give them a good home and enjoy their antics!